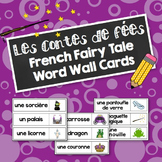 This package includes 4 pages of vocabulary, 28 worksheets, an original fairy tale and a template for students to create their own fairy tale. Students are provided with many speaking, reading and writing opportunities! 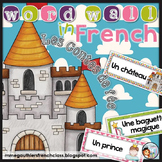 French Fairy Tale word wall that helps teach the elements of story. More than 100 words! Plus que 100 mots! Blank cards as well so you can add your own! 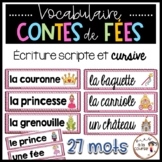 Mur de Mots pour les contes de fées. 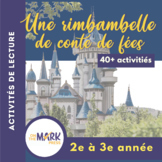 Excellent pour enseigner les éléments d'une histoire. Ces cartes sont séparées en plusieurs catégories: Qui? 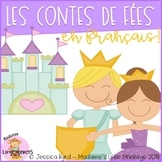 A list of 35 words and phrases for high school students to use when writing fairy tales (les contes de fées) en français. 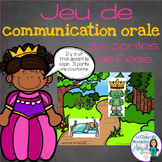 Small group language development activities for French Immersion students in Kindergarten/Des activités langagières de petit groupe pour les élèves en maternelle d'immersion française. 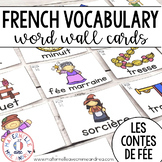 Word search for fairy tale vocabulary in French. 5 versions included for each of 2 formats. One has the list in French and one has the list in English. Perfect for Bien Dit 3 chapter 3, but may be used with any text.